Want to build a profitable blog but don't know where to start? The world needs your voice. You’ve got something powerful to say. Maybe you’ve got something powerful to sell. But it’s hard. You’ve got kids, partner, job. THE FULL 24/7, NON-STOP FIESTA. Got the energy and time to start a blog that brings in actual cash? Hold on there, girl, because if I can do it then so can you. The doors to Blogging to Win are currently closed but don’t worry, we open them periodically throughout the year. Enter your info to join our Waiting List and receive a discount when we reopen the doors in Summer 2019! Choose your bundle! Save $249 right now if you buy the Blogging to Win: Master Kit + Blogging Business Club bundle! I’m a blogger and I make a full time salary through my blog. I’ve gone from making $200/month blogging to over $12,000/month. 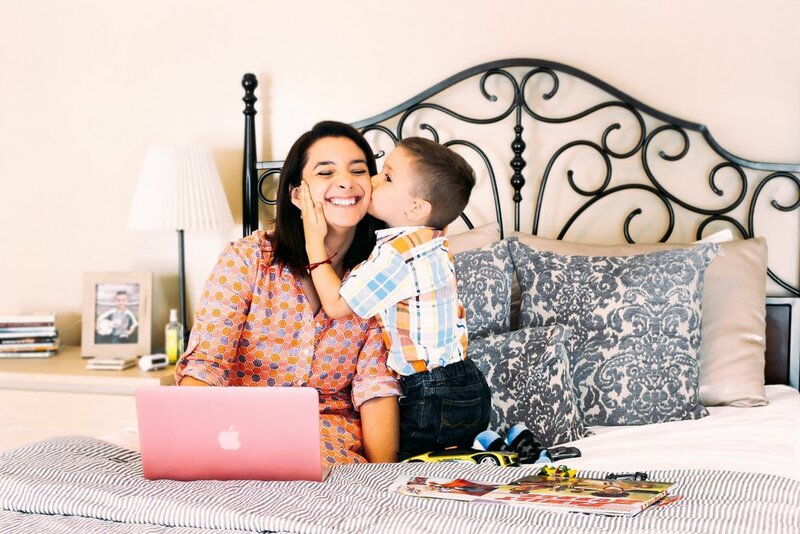 This is my full-time, hallelujah-I-can-be-a-SAHM*-and-travel-when-I-want job…and I want to share all of my secrets so you can do it someday soon, too. I made a lot of mistakes when I started blogging. I spent hours on linky parties and stressed myself out by trying to post three times a week, like they tell you. There was me, busy mama, trying to do blogging “right”, while doing the job thing AND trying to stop my wriggly jailbreak toddler from falling off the roof. Usual mom stuff. But, boy, did I learn stuff and now I want to share it with you. I’ve spent the last four years separating the blogging strategies that REALLY work from the ones that are simply a big fat waste of your precious time. I’m here for you. I want to help you create your own, unique blog that sings with your voice and makes you money. If you think we might be kindred spirits (#AnneofGreenGables #ILikedAnneWithAnE #notashamed) then join Blogging to Win because I made it for women like you and me. BECAUSE WHO DOESN'T LOVE AWESOME? My Blogging to Win course is an online eight-part course that will teach you to build a blogging business (not a hobby. Oh, so not a hobby) using the most effective strategies deployed by today’s most successful bloggers. Gets you a jump closer to building a money-making blog so that you can create the life you want to live. Tap the arrows to see the entire list of modules! Need something more advanced? Take a look at my Blogging Business Club, an online community that helps its members become better at the business side of blogging with advanced tutorials and lessons that go live on the 1st of each month. But, Allison, the world’s blogged out. I’ve got nothing original to say. They need your fresh perspective. They’re waiting for you to start. Your tribe will find you. Tap the arrows to read more reviews! “Blogging to Win is an amazing course that has transformed my blog. Allison is super knowledgeable, gets right to the point in her lessons. There's no fluff, just good quality information that can improve your blog in so many ways. I love how affordable the course is. I even signed up for a VERY pricey blogging course (we're talking about $1000 here) and decided to back out after seeing the course outline and realizing I felt confident enough with the knowledge I had already learned from Blogging to Win. When I started Blogging to Win, I was confused on so many things including Google Analytics, how to utilize Boardbooster and Pinterest. This course basically walked me through all of the things I already knew I needed to know but wasn't sure how to go about it. I love that I was able to take my time and can refer back to any of the lessons at any time. The format of the class was great, I loved having step by step processes to follow! “I relied on Google to help guide me through how to start a blog and learn best practices, but most posts were tailored more towards experienced bloggers. That's why I love the Blogging to Win Course. It equips you with all the necessary tools to feel confident in yourself as a blogger because knowledge is power! I'm a visual learner so watching step-by-step tutorials with screen shares made it simple to grasp complex blogging concepts. This aligns with my blog's mission to simplify day to day tasks to give my readers more time, money, and energy to live an enriched life. I got my Bachelor's and Master's in Engineering so I've implemented the techniques and problem solving skills I learned through my University days. “All I can say is great things about the Blogging To Win course! Allison is an amazing teacher and provides valuable information that would take weeks to research. This course has provided me with strong building blocks to create a sustainable blogging business. I now have more confidence to serve my audience of moms in helping them make cooking work. “As a new blogger I had a ton of courses to choose from. I found Allison through her website and Youtube videos and immediately fell in love with her friendly, easygoing personality and teaching style. I knew that I wanted to learn everything I could about blogging from her. It feels like you’re hanging out with a friend but an incredibly smart friend who’s going to help you launch a blog that wows. It’s clear that Allison has put her time, energy, and heart into her course, Blogging to Win. She’s passionate about making you the best blogger you can be and you can feel that energy through her videos and lessons. Blogging to Win has everything I needed to set up and grow my lifestyle blog. I had been in the research phase of blogging for over a year and this course gave me the confidence to actually start my blog. I knew if I followed the step-by-step lessons in the course I couldn’t go wrong, and I was right. “Blogging to Win has totally changed my life. I write a blog for people with chronic pain. My blog shares low-cost and no-cost ways to manage chronic pain. The Blogging to Win course is incredibly easy to navigate and provided a TON of helpful information. One of the most helpful modules is about Google Analytics. I'm intimidated by computer programs and software. I had tried to install Google Analytics before but I was so frustrated that I gave up. I even used Google's tutorial - no help at all. Then, I got to the Google Analytics module in Blogging to Win and Voila! I installed Google Analytics and I can actually understand what I'm looking at and why this is so important. The "Exercise" at the end of each section also lets me put to use the information that I just learned. This definitely helps me retain the information and understand what I just learned. I thought I knew all the areas I needed help in, but what totally slipped my mind was having a plan for my blog. I thought I could just wing it as I went. BTW not only helped me create a plan but also nail down what my objectives really were. "“I’ve been toying with the idea of starting a blog for years, but I didn’t know where to start. I didn’t even know what questions to ask. I found Allison’s YouTube videos and got inspired to take the leap into the blogging world, but I still had no idea how to get past just having the idea for the blog. It’s easy to create a money-making blog. It’s not. It’s hard work. But it’s hard work that’s invested in YOU, not in your day job. It’s hard work that’s worth it. Successful blogging is all about luck. Nope. Got news for you. Successful blogging is all about strategy and your original voice. Yes, you can do it by yourself. But why repeat the same mistakes that I’ve already made? Blogging to Win gives you a four years’ head start. Step-by-Step video tutorials for each module, including How to Analyze Your Competition, Creating and Inserting Pins in Your Blog Posts, How to Create a Subscriber Incentive, AND LOADS MORE! This bundle gives you Lifetime Access to Blogging to Win and a 1-year subscription to the Blogging Business Club. Cancel anytime with two itty bitty clicks. Tap the arrows to read more FAQ! + WHICH PACKAGE SHOULD I BUY? You have the option to purchase Blogging to Win by itself, or save $249 and purchase the Blogging to Win + Blogging Business Club bundle. The Blogging to Win Master Kit alone is best for you if you’re ready to create your blog and want to know how to build the framework for a profitable blog. The Blogging to Win Master Kit + Blogging Business Club bundle is best for you if you want to know how to build the framework for a profitable blog, get access to Allison’s secrets for selling products on your blog (aka see her top-secret sales funnels), and have 1:1 support from Allison herself in her private community (via Facebook)! There are four enrollment periods (spring, summer, fall, winter) where we accept new students each year but once you’re enrolled you can take as long as you like to complete the course. You decide whether you want to supercharge your way online or to take your time working your way through the modules. How does lifetime access sound? After enrolling, you have unlimited access to the Blogging to Win course for as long as you like - across any and all devices you own. The Blogging Business Club is a yearly subscription. Your membership will renew after 365 days, and you can cancel at anytime with two itty bitty clicks. It’s for anyone who wants to learn the successful strategies for building a profitable blogging business. It’s for people who don’t have the time or the inclination for link parties or spending hours on Facebook trying to convince people to visit their site. It’s for people who have real lives and chaotic families and limited time per week to spend blogging. It’s for you if you want to build a blogging business that creates authentic revenue –not just from sponsorship posts. Yes. The strategies and tactics can be applied to nearly every blogging niche, including (but certainly not limited to) DIY, personal finance, food, home management, decor and design, organization, crafts, parenting, fashion and business. The purpose of Blogging to Win is to help you create a profitable blogging business, rather than a particular type of blog. As long as this sounds like what you want, this course will work in your niche. Blogging to Win uses Wordpress and Squarespace as its examples for the backend portion of the tutorials – but don’t worry, you don’t need to use either one of these if there is another platform, like Wix, that you prefer. The same advice applies. + WHY SHOULD I PAY FOR THIS COURSE WHEN I CAN FIND FREE BLOGGING ADVICE ONLINE? + WHAT’S THE REFUND POLICY? My course only works if you do. A successful blogging business is hard work and there is no magic formula or workbook that can build a profitable platform for you overnight. If profitable blogging was that easy, everyone in the world would be doing it. If you’d like a refund, you have thirty days from the date you bought the course to ask me for one. When you purchase Blogging to Win, you agree to this timeline. More info? Check out my Refund Policy page linked at the bottom of this site.